We all thought there would be flying cars and teleportation by now, right? 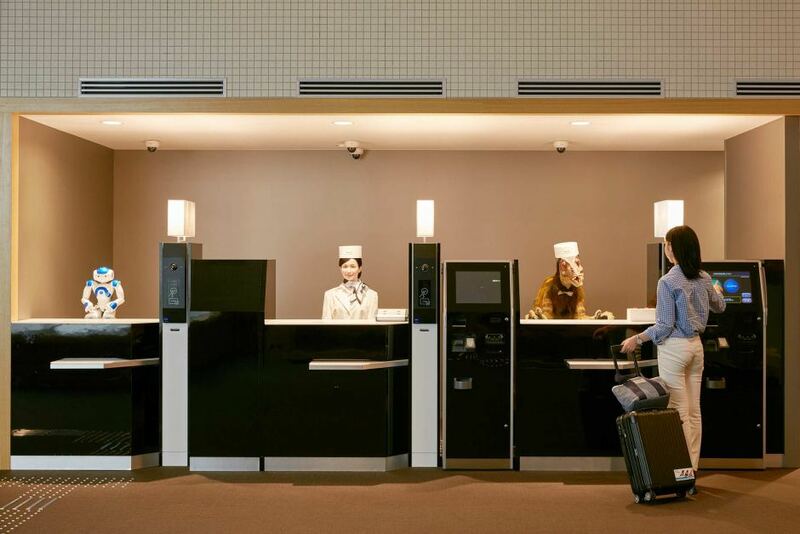 One thing Japan has dreamed up from the future – is a hotel staffed entirely by robots. I’m sure you never thought you’d be checked into your hotel by a talking dinosaur. Or maybe you never dreamed you could have a built in concierge in your room to help you figure out a yummy dinner spot. A new hotel in Japan has opened a hotel called Henn-na Hotel – translating to “Strange Hotel” – that can make those bizarre ideas a reality. No one likes dragging their luggage up to their rooms – don’t worry, because here, you’re in the future! You don’t have to. Punch in your room number and off goes a robotic luggage transporter to deliver your bags to your room without you lifting a finger. And just when you thought this place couldn’t get any better? Here’s the amazing part – it’s located in an amusement park! Seems like a place where dreams are made of! Don’t worry – there’s human staff always nearby in case of emergencies or maybe a serious language barrier issue. This hotel is sure to be a hit – they also have a commitment to go green by not providing TVs in the rooms. But really, who needs TV when you have your own friendly robot to talk to?